President Moon Jae-in on Monday ordered the military to submit all documents related to the allegation that the Defense Security Command had considered declaring martial law during massive protests against former President Park Geun-hye last year. According to Cheong Wa Dae, Moon demanded immediate submission of documents exchanged among military agencies during the anti-Park protests. The agencies involved include the Ministry of National Defense, Capital Defense Command, Army headquarters and Defense Security Command. 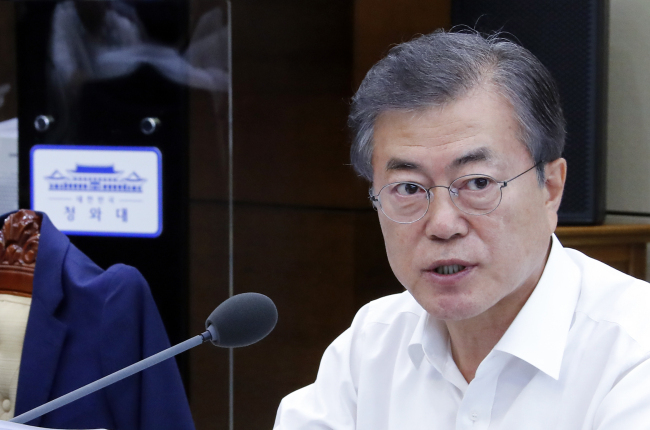 Moon’s instruction is aimed at discovering whether the document in question was an action plan to implement martial law or a contingency plan for eventualities, Cheong Wa Dae said, adding that the president’s order is separate from the ongoing military investigation. “As a commander in chief, the president needs to find out exactly what happened and whether the document was designed for actually implementing martial law,” Moon was quoted as saying by his spokesperson Kim Eui-kyeom. The military’s special investigation team led by Air Force judge advocate Col. Jeon Ik-soo on Monday officially launched a probe into the Defense Security Command. In addition to the martial law allegation, the command will also be investigated for the alleged surveilling of families of victims of the Sewol ferry sinking in 2014 amid public criticism against the Park administration’s mishandling of the incident. Moon’s order also comes amid suspicions that Defense Minister Song Young-moo might have tried to cover up the controversial document, which was briefed to Song by Defense Security Commander Gen. Lee Suk-goo on March 16. “I believed it was important to create a positive atmosphere for a successful inter-Korean summit. … After taking into account possible political consequences of such a revelation, I decided it would be better to withhold the document,” Song said. Song’s remarks contradicted his earlier explanation that his decision to withhold the document was “legally approved” by a nonmilitary government agency. Song had insisted the document was not subject to investigation until Moon ordered a thorough probe last week. The Board of Audit and Inspection on Sunday said Song had consulted BAI Chairman Choe Jae-hyeong on the martial law document, but it was not a legal review. The agency said it has never seen the document. Cheong Wa Dae said the defense minister first discussed the martial law document on April 30, but it was not an official briefing. According to the Defense Ministry, the official briefing took place on June 28, but the document was not submitted to the presidential office. “During last month’s meeting, Song described the document as an example of the Defense Security Command’s political meddling, rather than talking about the document independently,” a senior presidential aide told reporters under the customary condition of anonymity. In the document titled “Wartime Martial Law and Joint Action Plan,” the Defense Security Command said it could consider declaring martial law in the event that anti-Park protestors forced their way into the presidential office Cheong Wa Dae. Han’s aides claimed that the document was a reference for the worst case scenario in which police were unable to secure public safety. Han was not immediately available for comment.